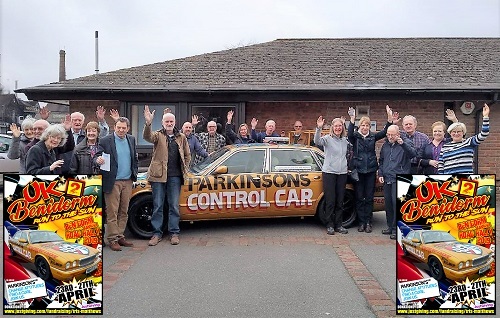 Members of Parkinson’s UK Lewes Support Group gave a big send-off to Tris and Debbie Matthews, ahead of their Run To The Sun in the Benidorm Banger Road Rally. The Stock Car enthusiasts, who live in Laughton, are set to join 60 or so other drivers setting out from the Ace Cafe on the old North Circular Road in NW London for the gruelling charity rally next month. The only qualifying rule for each car is that it must not have an on-the-road price greater than £300! Tris is 53 and was diagnosed with Parkinson’s in 2017. He said: “Stock Car Racing has been a huge part of my life, both as a spectator and a driver. “So we’ve dressed up a classic 1995 Daimler as a Spedeworth Control Car, in traditional colours but with Parkinson’s UK livery. Tris (pictured centre, with his hand on the windscreen) and Debbie will share the drive of more than 380 miles a day for four straight days, arriving in Benidorm on 27 April where all the cars completing the run will form up for a colourful parade along the seafront. An estimated 145,000 people in the UK have been diagnosed with Parkinson’s, the second most common progressive brain condition. There is no cure. Local groups of the national charity Parkinson’s UK, like the Lewes Group, provide friendship and practical support to people living with Parkinson’s, and raise funds to support research internationally. 	Tris and Debbie run Drivers4U (Southern), a commercial driver hire company based in Hailsham. They would like to thank the Filmer family and the following companies for their support: Eastbourne Coach Finishers, Cecil’s Rent A Rookie, H Ripley & Co metal recycling, Haulaways, Setyres (Hailsham), PJ Skips and Spedeworth motorsport. Graphics by Dave, Euro Self Drive.